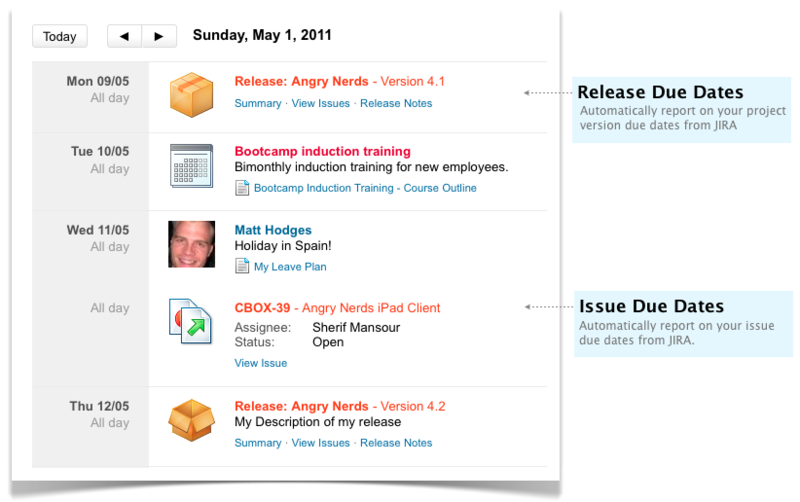 3 June 2011Atlassian presents Team Calendars 1.0. Where people, projects and content meet. Just like creating a space, you can now create calendars which can be shared with your team or the rest of your organization. Link events to people: Showing their profile picture for the event. 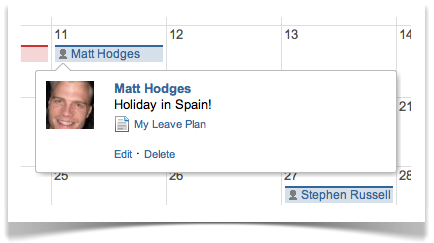 Link events to content: Allowing you to link to your leave, travel or roster plans to the actual event. 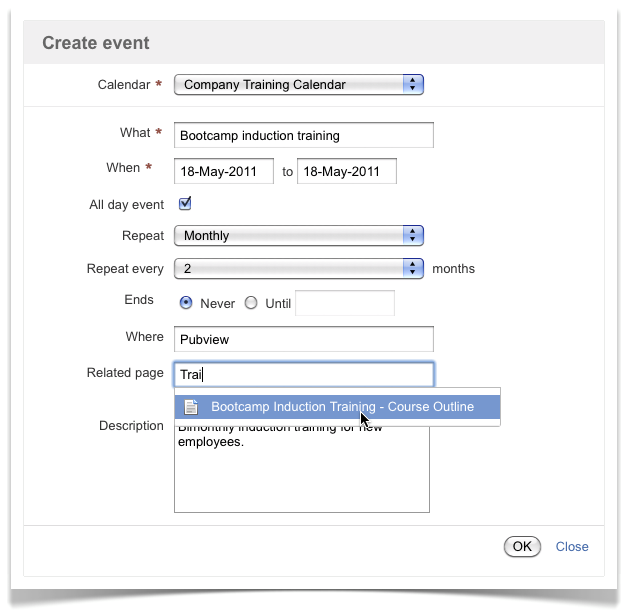 Create recurring events: So that you can easily plan rosters and repeating events. 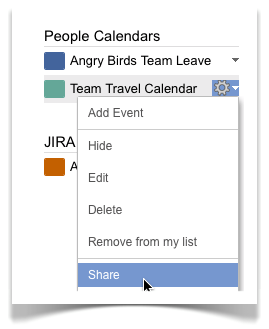 To make it easier to communicate your project release plans we've introduced JIRA Calendars. With JIRA calendars, you can now easily pull project version and issue due dates into Confluence to communicate your release to your team. Combining your JIRA release calendar with your team leave and travel calendar, managers can quickly see how the availability of their team can impact their project release schedules. Planning training events, company wide events or anything else.. We have a Events Calendar to help you do this. 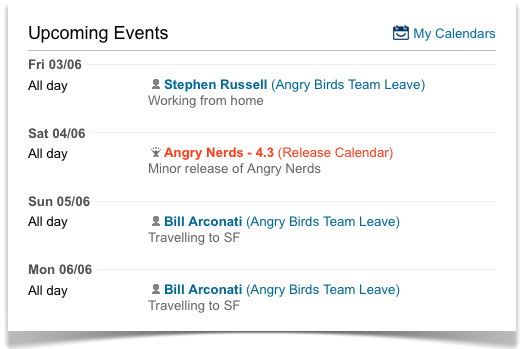 You can also link events to Confluence content for more event details. 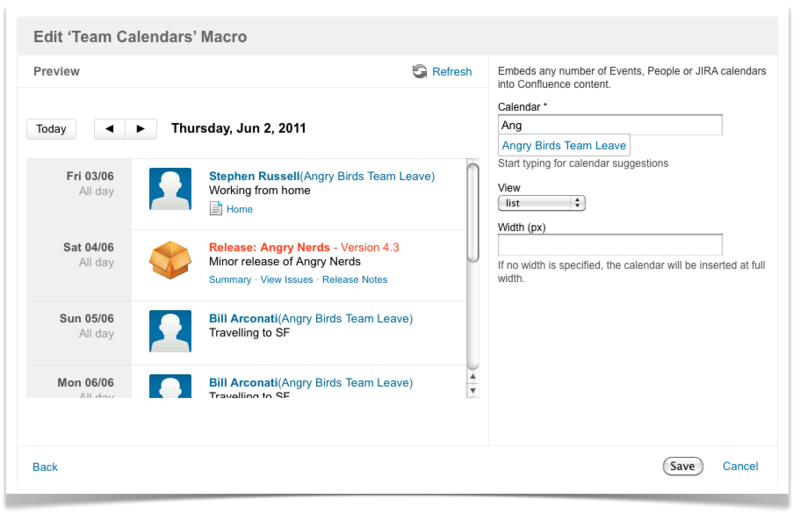 You can embed Team Calendars into Confluence content using the Confluence Macro Browser or Macro Autocomplete. Embed your release and people calendars on your team homepage or release status page to communicate upcoming events to your team. 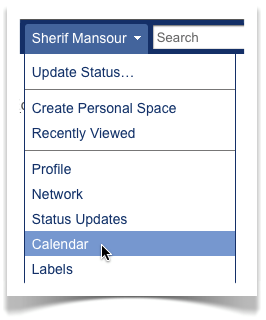 You can easily search, discover and share Team Calendars. New users arriving will be greeted with popular calendars and also have the ability to search for calendars. You can easily share a calendar with someone by sending them a link to a calendar. The user can then add that calendar to his or her calendar list. 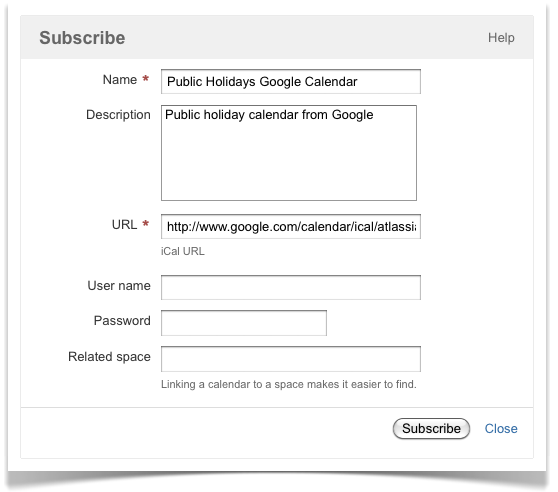 You can bring in external calendars (E.g. 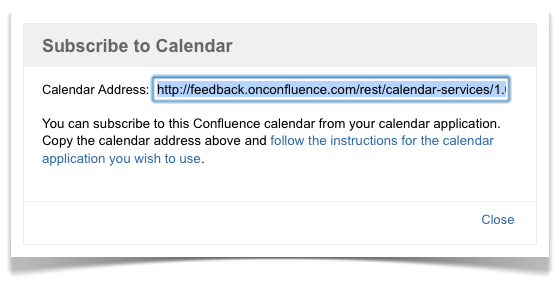 Google) as well as import iCal calendars into Confluence. 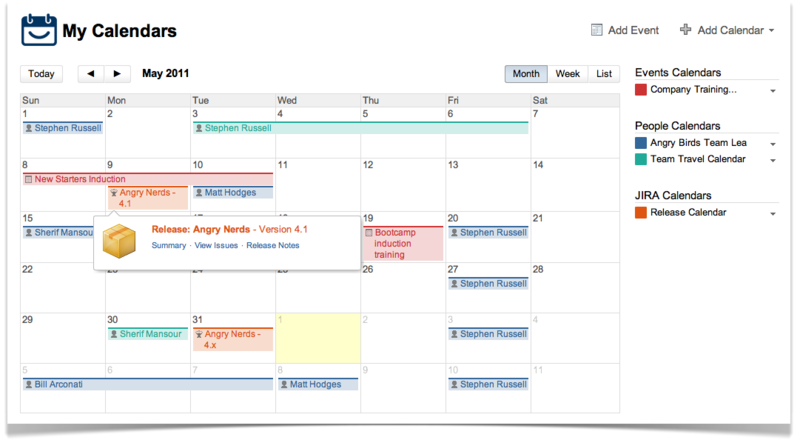 Mash them up with your existing Team Calendars so you have one single place for all your team events. You can also subscribe to Team Calendars from your favorite iCal compatible email client (e.g. iCalendar on Mac OS X). 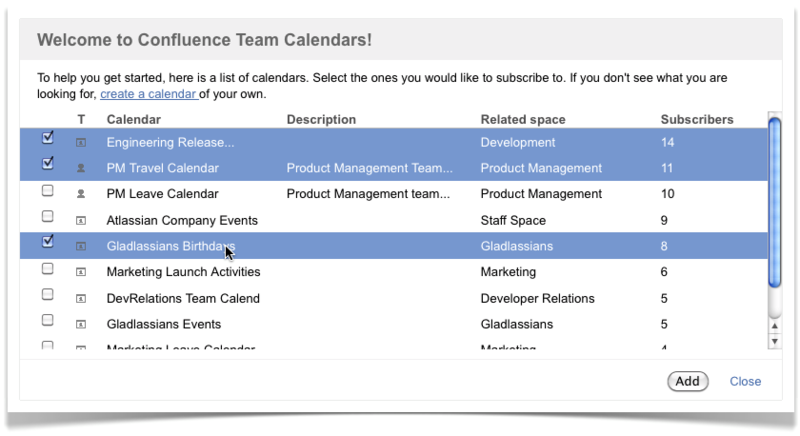 Thank you for your interest in Team Calendars for Confluence 1.0. From there, you can see plans in progress for new versions of Team Calendars, comment on issues, raise bug reports and feature requests.